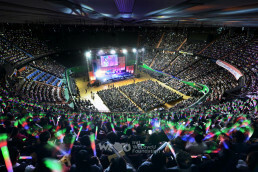 The New Life Welfare Foundation held the 3rd New Life Concert on January 27, 2002, a few days before the Lunar New Year’s Day, at the Busan KBS hall, sponsored by Busan Metropolitan Government, Kyunghyang Shinmun and Save the Children Korea. 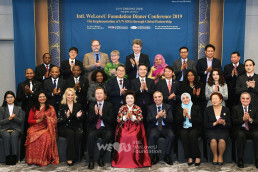 5,000 members of the foundation and the guests from inside and outside of Korea attended the concert: Lee Sang-hee the Grand National Party Lawmaker, Yun Won-ho the Democratic Party Lawmaker, Don Min Jie the Chinese Vice-Consul in Busan. At the donation delivery ceremony, the New Life Welfare Foundation Chairwoman Zahng Gil-jah appeared on the stage and delivered medical expenses and living expenses in person to four children with heart disease including Jeong Yun-ju (4, Jung-dong, Haeundae-gu, Busan) and ten parentless households including Jin Su-jin (13, Geumgok-dong, Buk-gu, Busan). Chairwoman Zahng Gil-jah expressed her appreciation to the members and the guests, saying, “Greeting the Year of Sheep by the Chinese calendar, I hope that we will be full of love and hope like the meek and pure sheep.” She emphasized that the concert should become an event to share love and hope not material, and repeatedly requested that the attendants should continue to give love and concern to their neighbors this year, too. 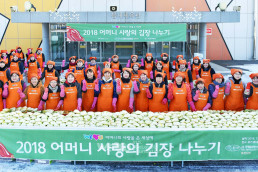 Lee Sang-hee the Grand National Party Lawmaker, and Yun Won-ho the Democratic Party Lawmaker complimented the members on their volunteer service activities in various fields. Park Jong-ung the Lawmaker and Chairman of Health and Welfare Committee of National Assembly, and Han Hwa-gap the Lawmaker sent congratulatory messages, which showed that the political world had interest in this event. The concert started with a performance of an invited orchestra, and various performances were followed; Chae Seong-hui the Gayageum Chief Performer of the National Center for Korean Traditional Performing Arts, and Cho Il-ha the Korean Traditional Sacred Song Singer performed a great play; and beautiful song, “Missing Geumgang Mountain,” and dancing of the New Life Children Choir captured 5,000 audiences’ hearts.